Review date: 29 April 2000. Behold! The Swiss Army Keyboard! It slices, it dices, it takes stones out of horses' hooves. It's all funny looking and curvy. It's got two kinds of connector on its cable, and two USB ports on the back. It's really expensive. And it's made by Microsoft, so it must be good! OK, now I've got all the cynicism out of my system. It doesn't look quite as weird in plan view. The four things about this keyboard that might, on the face of it, suggest that it's a complete waste of time - scads of funny little function keys, split design, high price and Microsoft manufacture - are not actually as bad as they sound. Two of 'em are actually plusses. Heck, this might even be the keyboard you've been waiting for all your life. Firstly, you can say what you like about Microsoft software - and I recommend you do, loudly, because catharsis is good for you - but their hardware is fine. From the original bar-of-soap mouse to their current line of snazzy ball-less optical mouses, curvy keyboards and funky game controllers, Microsoft, contrary to all sensible expectations, make some quite nice gear. The software guys must not be in charge of the hardware division, because Microsoft hardware steadfastly refuses to catch fire every hour on the hour. The split, ergonomic design of the Natural Keyboard line works nicely, too. If you're a two-finger typist then you'll have a hard time on any kind of keyboard, but if you're reasonably speedy, you'll probably find that your hands naturally stay on the correct sides of the keyboard. Whether you learned proper touch typing or, like me, just picked it up as you went along, there's no way to type fast without using one hand for each side of the 'board. Switching to a split 'board may, therefore, result in the occasional stumble as you learn which of the centre-column keys fall on which side, but it's surprisingly easy to get the hang of it. And it genuinely is ergonomically superior. Unless your shoulders are only eight inches wide, your arms will, of necessity, angle inwards towards your keyboard. It's therefore more comfortable and, yes, more natural, if the keyboard's cut down the middle and bent outwards to line up with your hands. The Natural Keyboard, and other split-boards like the Acer Future Keyboard I review here, save you from having to angle your wrists outwards while you type. Fancier split keyboards have adjustable geometry, so you can change the central hinge angle to suit your situation. But fixed-angle models like the Microsoft Natural Keyboard line work perfectly well, and cost less. The integrated palm rest built into the Natural Keyboard Pro encourages you to rest the heels of your hands while you type, which is ergonomically Very Bad, but if you use it as you're supposed to and only rest there when you're not typing at that moment, it works well. And you can't blame Microsoft if you hurt yourself. There's an alarming orange tag on the cable that exhorts you to read the stickers on the underside of the 'board. That's right - stickers, plural. There's so much terrifying text there that they couldn't fit it on just one warning label. 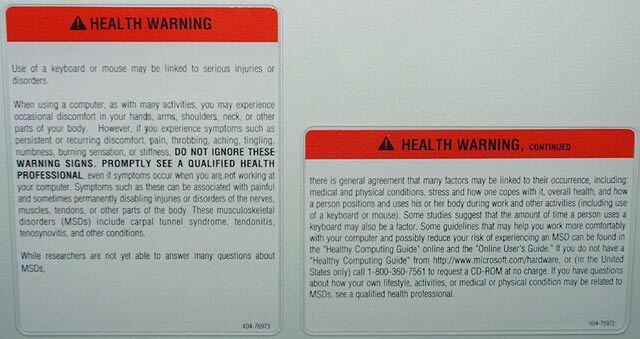 The warnings themselves are the usual manufacturer-covering-itself stuff that all sorts of keyboards come with these days. But there's still an awful lot of text, compared with the amount you get on, say, a cigarette packet. At first glance, these stickers suggest that using this or any other keyboard is about as safe as walking into a Glasgow pub five minutes before closing time on Robbie Burns' birthday and loudly explaining that, in your opinion, William Wallace was a bit of a nancy boy. So what don't I like about this keyboard's special features? The price and the special-function keys, that's what. The price is the biggie. This thing'll cost you something like $AU140 retail, folks. The U.S. list price is $US75. Now, $AU140 may not be that much to spend for a computer-gizmo, but it's rather darn steep for a keyboard. You can get OK keyboards for $AU25. 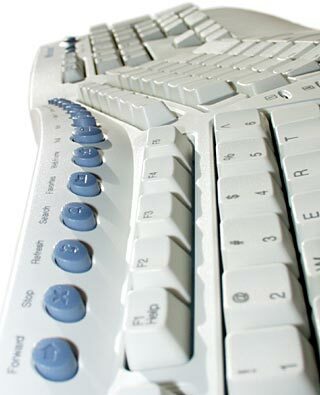 You can get less elaborate Natural Keyboards for $AU65. That's the price of the Natural Keyboard Elite, whose only bad feature is that it rearranges the cursor keys and the key-block above them into a funny diamond and vertical rectangle. So what are you paying for, then? Well, the encrustation of special keys, and the USB connections. The hot keys are the obvious feature. 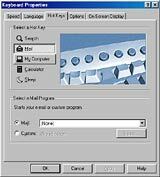 The Natural Keyboard Pro has 19 of them, in addition to the standard 104 keys you get on every other PC keyboard with Windows keys. 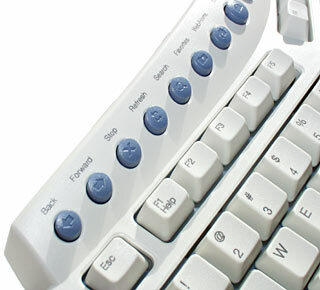 Most extra-buttons keyboards have rubber hot keys; these ones are plastic. Every one of them has some Windows-related function; users of other operating systems can go whistle, or write their own support software. There is, undeniably, demand for keyboards like this. 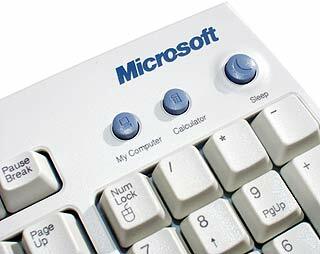 Various manufacturers make 'boards liberally encrusted with function keys, and people buy 'em. It's gadget appeal, I suppose. But Windows already lets you set up hot keys for particular programs, and the ones on the Natural Keyboard just don't do anything all that amazing. Windows by itself gives you plentiful ways to rapidly launch oft-used software, and there's a plethora of third party freeware and shareware programs that give you icon docks and hotkeys and macros that do similar tricks. I'm unconvinced that special hot keys are enough of an improvement over these other launching methods to make them worth paying for. Some of the special keys on the Natural Keyboard Pro are just redundant. You get Back and Forward keys, whose function is perfectly duplicated, so far as I can see, by Backspace and Shift-Backspace. Similarly, the Stop key doesn't do anything Escape doesn't do, and Refresh is no better than F5. The Natural Keyboard Pro's Search button, by default, does the same thing that'd happen if you clicked the Search button in Internet Explorer. Favorites brings up an Explorer view of the Favorites folder, Web/Home opens a browser set to your home page, and Mail runs your default mail program. 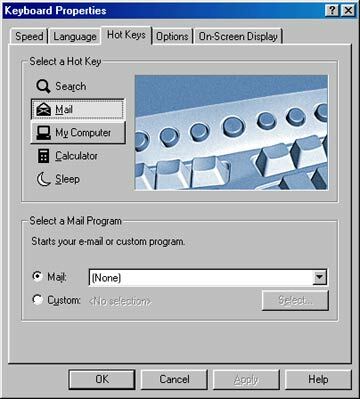 All eight buttons in the main row, to the right of the central Mail button, are audio controls. Mute, volume up and down, play/pause, stop, previous track, next track, and a "Media" button that brings up a list of all of the Windows Media source software you have installed. Above the keypad you get a My Computer button, which opens the appropriate window, and a Calculator key. There's also a Sleep button, which will cause your computer to attempt to go into Suspend mode. If your computer can't do it, but Windows thinks it can, you should put a sticky label under "Sleep" with the more accurate description, "Hang". Count yourself lucky. At least the Natural Keyboard Pro doesn't have an off button, like the Ortek Eagle Touch 'boards I review here. The included IntelliType Pro software lets you change the behaviour of the Search, Mail, My Computer, Calculator and Sleep buttons, but you can't remap any of the others. Mind you, there is a built-in feature that lets you disable any or all of the special Windows keys clustered around the space bar, which is a nice touch. The two USB ports on the Natural Keyboard Pro let you plug in your USB mouse, and one other USB device, without fiddling around at the back of your PC. Well, except for the fiddling you have to do to plug in the Natural Keyboard Pro itself; its cable bifurcates into a PS/2 connector and a USB one. 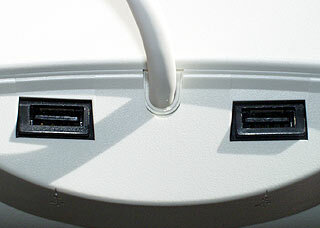 The PS/2 connector is a perfectly ordinary keyboard plug. The USB connector, on the other hand, can serve as the only connector you need - it feeds the two ports that flank the point where the cable enters the keyboard, but it also lets you use the Natural Keyboard Pro is as a proper USB 'board. You only need to plug in the PS/2 connector if you want keyboard support for software that doesn't understand USB keyboards, like maybe your BIOS setup utility, or separately booted DOS games, or other older operating systems. 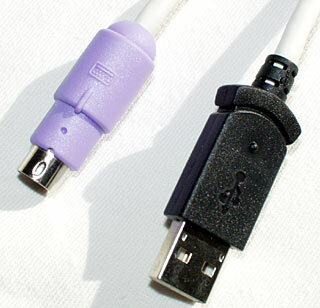 USB has the ability to accommodate up to 127 devices per root hub, but it can only do it if you've got enough ports. You increase the number of ports by plugging in extra hubs - devices that plug into one port, and provide more. Think double adaptors and power-boards; it's a similar idea. Plugging hubs into other hubs is called "cascading", and it's only possible from "self powered" hubs - hubs that have their own power supply. A self powered hub, which if it's a stand-alone device will be powered by a simple plugpack supply, can deliver up to 500 milliamps of current to each of its ports. If a hub doesn't have its own power supply, it's called a "bus powered" hub, and it can only deliver up to 500 milliamps of current to all of its ports put together. This makes sense, because the extra current has to come from somewhere, and where it comes from is the single port on a self powered hub that the bus powered hub's plugged into. There are many USB hubs that can work in both modes - connect the plugpack they come with and they're self powered, leave it in the box and they're bus powered. The Natural Keyboard Pro's little two port hub, though, is purely bus powered. If you run out of current, nothing disastrous happens - your USB gadgets just don't work until you add some more juice. Most hubs shine a sad little red light at you when you're asking too much of them. Many USB devices, of course, consume much less than 500 milliamps. Most USB things that actually need a decent amount of power - USB Zip drives, for instance - come with a separate power supply of their own. Things like mouses, which are obviously what most users are going to plug into the back of the Natural Keyboard Pro, don't draw much at all. And, of course, a mere two port bus powered hub like the Natural Keyboard Pro's only has a pair of ports that can possibly need power, and so can handle a 250 milliamp device plugged into each of 'em. So the only real limitation is that you can't cascade more hubs from the Natural Keyboard Pro's ports. If you want more ports, you shouldn't have to do inelegant things with cables, because normal PCs have at least two USB root hub ports on the back. Plug the Natural Keyboard Pro into one of the root ports and a separate hub into the other, and you'll be in business. This keyboard, like pretty much every other half-decent 'board on the market, uses rubber dome keyswitches. They give a reasonably positive key-feel - a slight clicky sensation when you depress a key - without making much noise. 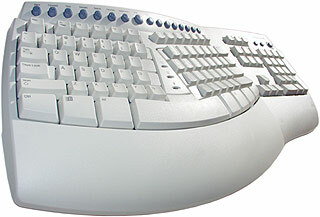 The Natural Keyboard Pro is more solidly constructed than most rubber dome 'boards, so its keys make only a quiet "clunk" even when you hit them quite hard. It's a cubicle-friendly keyboard; you won't annoy your neighbours. But if you do a lot of typing, there can be little argument that while rubber dome 'boards are better than truly cheap and nasty units, they're still not nearly as good as buckling spring keyboards. Buckling spring keyswitches are legendarily durable, and give a very definite click that invariably exactly coincides with the actual actuation of the switch (rubber dome keyswitches can "click" just before they actually make contact). But buckling spring keyboards are expensive and loud, and so they're out of fashion. You can still get them, though; I review the still-available classic IBM 42H1292 here. The melodiously named 42H1292 is big, heavy, noisy, indestructible and lovely to type on, and it's been on sale from Lexmark keyboard patent owner PCKeyboards for $US49. Which makes it, for US purchasers at least, quite a bit cheaper than the Natural Keyboard Pro. Given the choice, I'd definitely buy the IBM monster-board. Apart from the obvious changes imposed by the split design, the Natural Keyboards have a pleasingly standard layout. But it's not perfect. The function key row has half-size keys - full width, but half depth - and it's bunched up. Function keys, on a normal keyboard, are split up into three blocks of four. This makes it easy to instantly find the key you're after, with a bit of practice. Just as a pianist uses the black-note groups for orientation, an experienced typist knows F5 lives to the right of the first break. Simple. Stuffing the function keys together into a row of five and a row of seven, as the Natural Keyboards do, shifts the goalposts. It's annoying if you use function keys a lot. Slimming the keys down makes things no easier. If you're not a regular function key user, that's probably because you prefer to do things with the mouse, right? After all, most function key jobs can be done with a couple of clicks. And if you're that kind of person, then what the heck are you going to do with 19 more bloomin' function keys? The location of the hot keys on the Natural Keyboard Pro, right up there at the back, may look nice in a picture but it hardly lets them fall easily to hand. Audio controls you might not have to hit that often, but if they seriously expect you to use the Back and Forward keys, they shouldn't be hiding almost an inch behind Escape. Backspace is much easier to reach than Back. Slimming down the "real" function keys to stick in some inadequately customisable, somewhat redundant extra buttons isn't, to my mind, any sort of useability breakthrough. My opinion isn't likely to matter much, though. People seem to love Swiss Army Keyboards, even expensive ones. 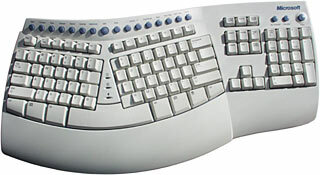 But if I had my heart set on a Microsoft split-board and USB hub, I'd get the plain Natural Keyboard for $AU75 less, then spend most of that $75 on a stand-alone self-powered four (or more) port hub. Sure, a lot of people don't know they can press F5 to do a refresh in all sorts of software, including Windows Explorer and Internet Explorer. That doesn't mean they should spend a lot of money for a keyboard with a specially labelled button for the function, though. The Natural Keyboard is not a bad thing. But the Natural Keyboard Pro is over the top. The additions are too expensive, and not much use. If you like the feel of the thing, get the cheaper Elite instead. 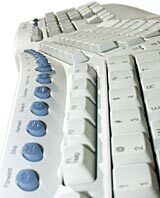 Aus PC Market doesn't sell this product any more (click here to see their current keyboard-related products), but you can still try a price search at DealTime!